Last year. Today I've been thinking about last year. When we escaped the endless winter by going south... twice. When we spent two weeks before Christmas in Costa Rica. A week on the west coast at a small resort near Quepos, where there was warmth and colour. And no snow. Hubby snapped this view on a day trip drive we took. And this one just behind where I was lounging by the pool. Pool pictures were NOT allowed ... by order of moi. Then we spent a week on the move. We drove inland and up into the cloud forest to Santa Elena, near Monteverde. Where the roads were unpaved, but there were still traffic jams. Like this one. And views like this. Gorgeous. Then we moved on to Arenal. And spent a few days hiking and looking at volcanos. Then back home...to the snow. But in February we escaped the snow-that-never-stopped, again, for a few weeks. We drove south to visit friends on Jekyll Island. And saw beautiful Georgia sunsets. Like this. And had a good old time eating ribs and drinking wine out of plastic cups at Captain Stan's Smokehouse. We loved this place. Then we moved on south to the Florida Keys. Where the flowers were brilliant. Hubby loves to take pictures of flowers. And the wildlife posed for pictures. Or couldn't be bothered to move. Then we ambled back to Naples, Florida, to visit friends who spend a good part of the winter there. I undertook a little retail therapy, and Hubby golfed. 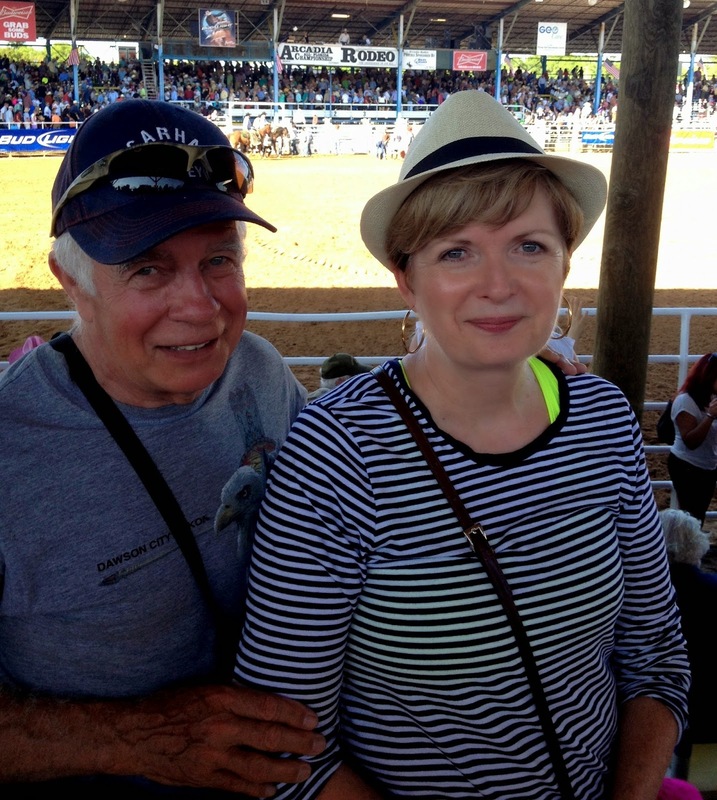 And we even spent a day at the rodeo. That was a hoot. Then we drove home to the... you guessed it... snow. The snow that never stopped falling and didn't leave until June. At least, that's what it felt like. But this year we're staying put until spring. So I'm endeavoring to be positive about winter, which is no great hardship, if I'm honest. With sunny days that give you a view like this... winter can be beautiful. And on a gorgeous day last week when I ventured into Manotick for coffee with a friend, I chastised myself for not appreciating, or extolling, the virtues of our little village. For one thing we have a few lovely places to dine and sip. Like the French Cafe where I was meeting my friend Catherine, for lattes and a chat in front of the fire. And some of the old houses off Main Street still retain the historic flavour of old Manotick. Not to mention Watson's Mill, the historic gem of the village, which still stands proudly on the bank of the Rideau River. I strolled down onto the dam to get these shots. Then back to the car because, as you can see, the sun was sinking in the west (oh.. I do love a good cliché.) Time was getting on. And I still had to get to the library and the wine store.... before heading home.... where Hubby was making dinner. Retirement is tough, eh? Yep. Winter isn't so bad. A couple of sunny ski days, a glass of wine in front of the fire, a pot of strong tea and a good book. That's about all it takes to warm my little heart and make me glad we're staying put this year. And the winter, and my new more casual lifestyle, gives me the perfect excuse to haul these babies out of the closet for the first time in years. I hadn't worn these chocolate brown suede and leather boots for a long time until I wrote this post. And I wouldn't be doing this if we were going south, now would I? What are you doing this winter? Going south? Or staying put? I'm linking up today with Thursday Blog Hop at Over 50, Feeling 40., Passion 4 Fashion at Rachel the Hat, and Fab Favourites at Style Elixir, Manic Monday at More Pieces of Me. I love your photos! You (almost) make me happy that I will be home (MA) to experience winter. We will spend a week in Naples in March for rest and retail therapy. Any suggestions? I only had one day to shop and we visited an outlet mall north of the city. At least I think it was north. My friend was driving so I didn't pay very much attention to where we were going, unfortunately. I found a couple of lovely sweaters at Brooks Brothers and loved the Kate Spade shop where I got a great deal on a purse and some jewellry. Then we got caught in a downpour so we gave up on the shopping and went for lunch. Hope you enjoy your time in Naples. I know the snow must be a real PITA after a few weeks, but DAMN it's lovely. I was in Costa Rica in the early 80's, and Monteverde was one of the places visited. I understand it's really changed quite a bit in the last 30 years; when we were there was still fairly primitive once you were outside of San Jose. It was so pretty though and I wouldn't mind going back. Santa Elena is still pretty unspoiled... but I don't know what it was like before. The centre of the town has all the usual tourist amenities, and is quite touristy, naturally. Still it was lovely. Gorgeous pictures! I'd do just what you do if we got snow. It's warm T shirt weather here in northern CA so we plan to stay right here:)) Great boots! Ah... tee shirt weather... I remember that. I may finally get a chance to go south in winter once I've retired -- it hasn't been a possibility given our academic schedule. Your photos show that you have much to appreciate all around you -- beautiful architecture that really suits the winter. I hear you. For years we only ever travelled in winter on the March Break...and then it was always for a ski holiday. Then I took two half-year leaves of absence in 2003 and 2008. We travelled to New Zealand and Australia, each time....that was amazing. I'd never experienced heat in February before. Crazy, maybe. But we might as well make the most of it, eh? I've been to Quebec City in winter and it's wonderful. Oh, I know what you mean about Scotland, We were there in the summer, so maybe only had three seasons in a day. Still we loved it. Especially our time on Orkney. I have never travelled south in winter but, oh, how your photos of Manotick made me nostalgic for my "home and native land," especially its unique winter light and open skies. I grew up on the prairies but moved to the US in my twenties, though I regularly visit family members in Ottawa. It is a lovely region of Canada. I have been visiting your blog for about a year and have to say that you remind me so much of the wonderful middle-aged Canadian women friends that I keep in touch with: thoughtful, introspective, well-read, self-effacing, stylish, youthful, and adventurous. Most people in the midwestern US who are near retirement dream of moving south to Florida or Arizona. I'd be more than content to return to Canada. I think the Canadian winters cultivate a sense of community and egalitarianism that is not quite so common south of the 49th parallel. Wow...thanks for the kind words. You're right, you know. I never thought of it before, but winter does create a kind of egalitarianism. Everyone looks the same in their parka....can't tell if they're wearing designer gear or not! Thanks for reading, and for commenting. Just gorgeous images...I would love a trip like this. Thanks for sharing with the Thursday Blog Hop, Susan. Thanks Pam. And thanks for hosting. your photos are amazing, such stunning views. Costa Rica looks the perfect place to explore, you're very fortunate. You live in a lovely area too. Thanks, Lorna. I am fortunate. Every time we go on a trip, I think that. Lots of people do not have the opportunity to travel. Thanks for stopping by. Thanks, Libby. For the kind words and the link. Next time we head south I'll give you a shout!